Nothing pays tribute to pretty much consistently warm weather all year round better than a cocktail (or six) at some of the Island city’s favorite rooftop bars and lounges. On our list of favorites, we round up a little something for everyone —- whether it’s spectacular views and city suits or whimsical décor and a hip professional crowd that you seek, we take you on a quick tour of the city’s finest rooftop bars. 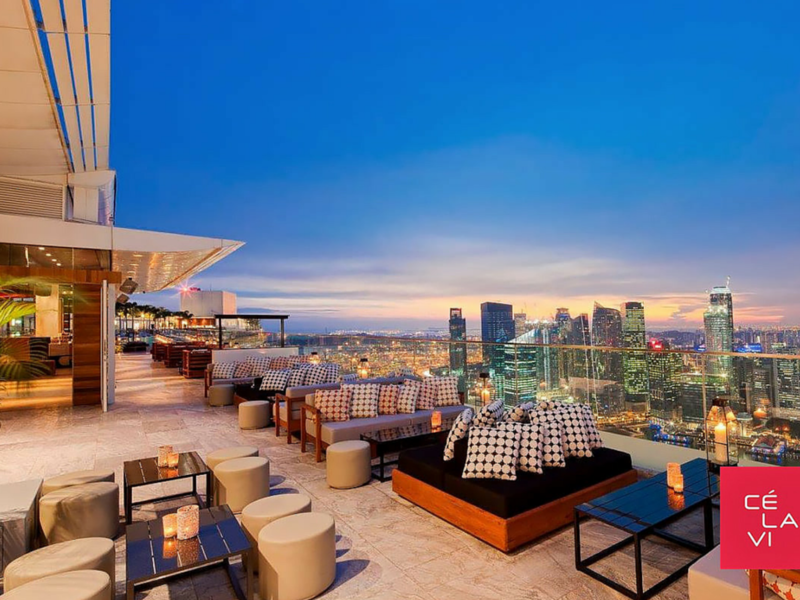 Located atop the Marina Bay Sands hotel, Cé La Vi remains the coveted spot to be and be seen in, as far as rooftop locations go. Its Club lounge features a dance floor that is bordered across its length and width by a sleek bar that offers signature cocktails masterfully created by Cé La Vi mixologists. The brand is viewed as more global than local, so you never know who you will run into. And, depending on the night you choose, you will be entertained by world class DJs and hosts who will have you dancing the night away. This, friends, is the life. This award winning bar & lounge has received global accolades for its rooftop experience and great fusion cuisine, and it continues to live up to its excellent standards. 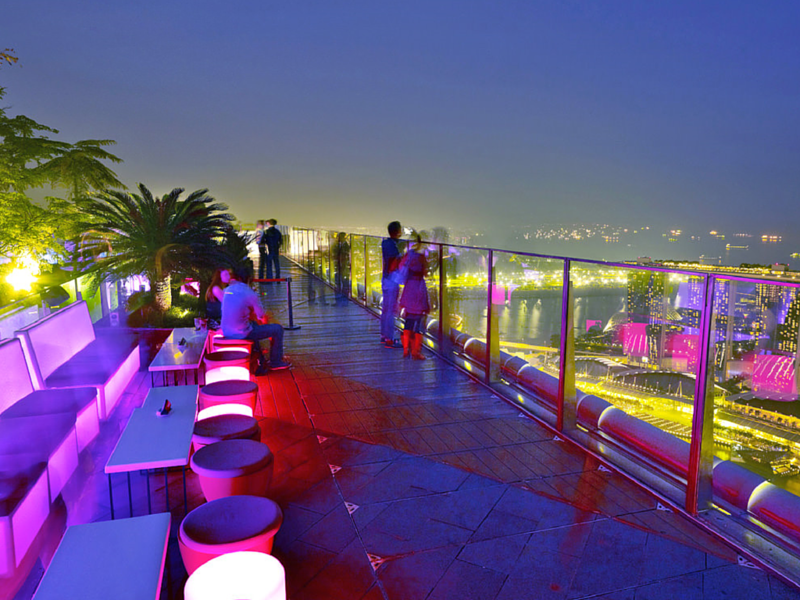 Situated 282m (3035 feet) above sea level, 1-Altitude Gallery & Bar ranks as the highest rooftop bar in the world, with panoramic views of the city. If you’re looking to dine Al fresco, you will find their menu options to be very expansive – just right for every possible palate. 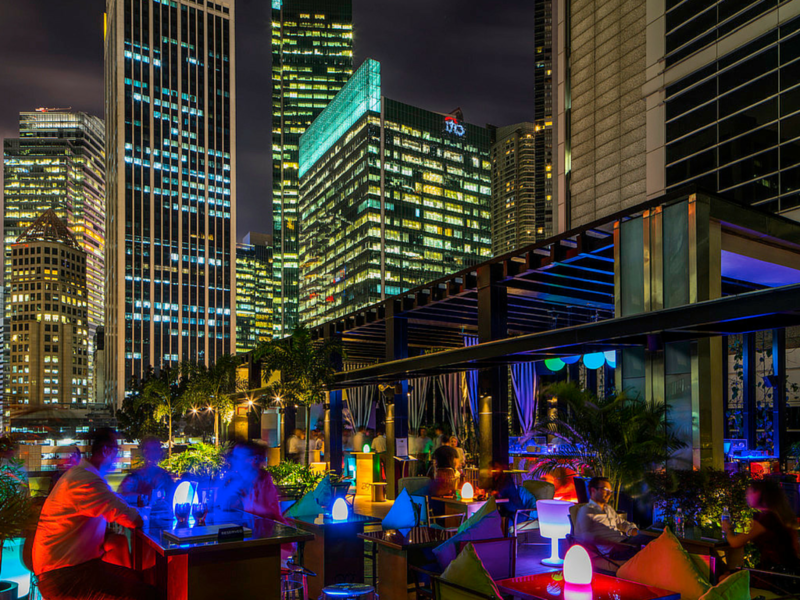 The Hi-So rooftop bar in the luxurious Sofitel SO Singapore appears to be understated, but is truly upscale in its offerings. The venue attracts a swanky crowd of professionals as well as the city’s socialites, and is a great spot to relax and let your hair down. If you are down for a corporate, intimate family or social event at Hi-So, you will be offered a wide selection of vintage and wines, ultramodern cocktails and the finest champagne around. Japanese class + Urban grit = Kinki. And it comes with an even more inspirational story. Former Sumo wrestler turned Chef, Kinki Chan has proven over and over again that size does not matter, as long as you are willing to think big. And think big he has. 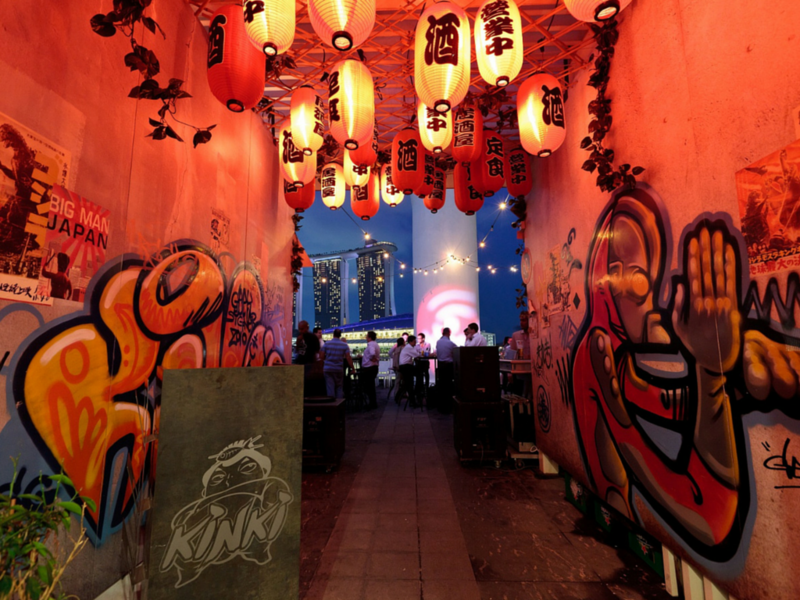 This celebrated location manages to merge everything that is Japanese with a lit ambiance that emphasizes urbanistic ideals. Their Spicy Hachimitshu cocktail is well worth it. Bottoms up! Tiger’s Milk proves that you don’t necessarily have to go to Peru to experience the South American destination. 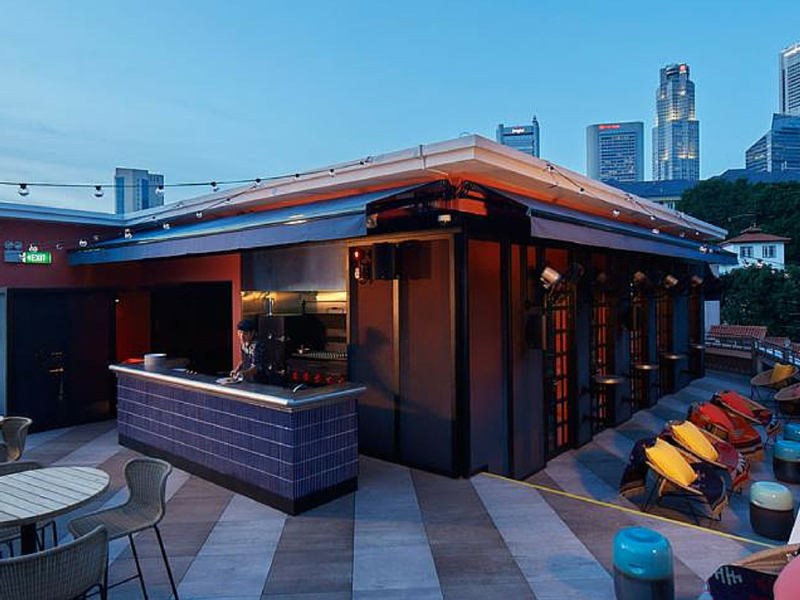 In a stylish yet laid back atmosphere, the first Peruvian rooftop bar in Singapore offers a cerviche bar with small plates which include roasted beet quinoa, hearts of palm and crisp sweet potato & yam chips. You might also want to try its famed Tiger’s Milk Trio, which is essentially three shots of ceviche marinade with chopped sea bass and octopus. It is great for a low-key weekend hangout with good friends or family.